"Bloodties Part One: Family Legacy"
"Bloodties" begins as Cortez kidnaps Magneto's granddaughter and kicks off a civil war in Genosha. Fabian Cortez & the kidnapped Luna Maximoff look out over the burning capital city of Genosha. Meanwhile, Val Cooper, Nick Fury & Henry Peter Gyrich discuss the Genoshan situation and their plans for handling it, which leads to Nick Fury meeting with both teams of Avengers to explicitly inform them that the UN wants them to stay out of the situation. 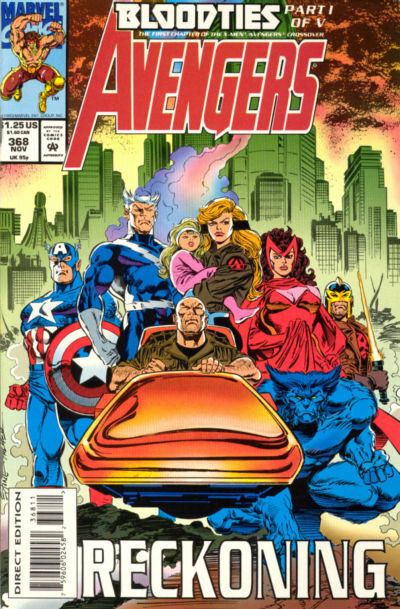 The Avengers are puzzled by the fervor of Fury's demand, until they realize that Luna, Crystal's daughter - Magneto's granddaughter - is likely to be a target. Crystal rushes to her daughter's room only to discover she has been replaced by a Genoshan mutate, who promptly blows herself up. Meanwhile, Gyrich tasks Professor X with attempting to broker peace in Genosha, and they depart for the country along with Beast and US Agent, with Xavier telepathically sending the X-Men on ahead of him as well. 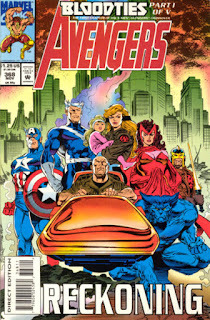 Back at the Avengers' complex, the group rushes to their hanger to depart for Genosha, only to find a contingent of heavily armed SHIELD forces ready to prevent them from leaving, while in Genosha, Cortez broadcasts a message declaring, in the name of Magneto, that all human forces in the country lay down their arms, or else the mutates will begin killing every human man, woman and child in the city. X-aminations in January 2018...and Beyond! First, a quick scheduling note: it turns out I don't have a digital copy of Thunderstrike #2-3 (and finding one is turning out to be slightly more difficult than it should be), so I've put those issues on the list for a future Retro X-amination, and will instead be reviewing Avengers #368, the first part of "Bloodties", for my December 27th review. 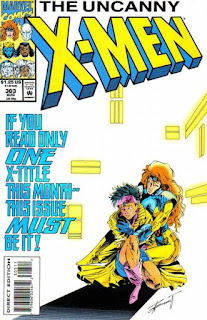 The first half of 2018 brings the publication year of 1993 to a close, and with it, an end to the celebration of the X-Men's 30th anniversary, as both "Fatal Attractions" concludes (finally) and the whole anniversary shebang is closed out with the X-Men/Avengers crossover, "Bloodties". But Marvel, still flooding the market with product even as the effects of speculator market bubble bursting are starting to be felt, barely slows down, continuing to churn out additional one-shots and limited series in addition to the seven monthly X-books, the quarterly X-Men Unlimited, and the series' annuals (not to mention the reprint X-Men Classics, which is joined by Sabretooth Classics and X-Men: The Early Years in 1994, X-Men Adventures, the tie-in book to the animated series, the updated Official Marvel Index to the X-Men, and X-Men 2099). 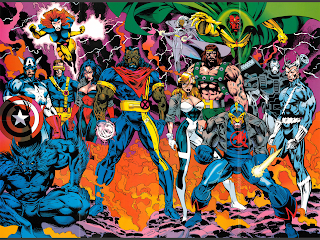 The X-books, long-established as the crown jewel, sales-wise, of Marvel's catalog, manage to stave off the effects of the market crash far longer than most other franchises; even as Marvel finally begins scaling back and cancelling series in the second half of '94 and into '95, the X-books continue to expand, adding another monthly book (Generation X) in 1994 and another (X-Man) in 1995, along with evermore extra limited series and one-shots. 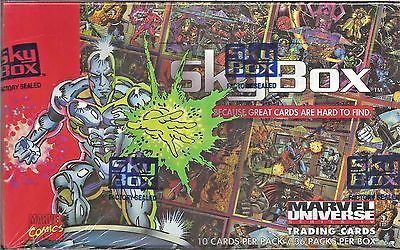 90 cards (including checklist card) with an eight card subset of chase cards. 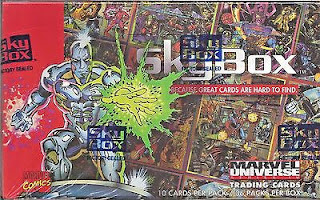 Card fronts feature series title on the top, with the character name on the bottom, with no other borders. Cardbacks feature character's real name, group affiliation (where applicable). 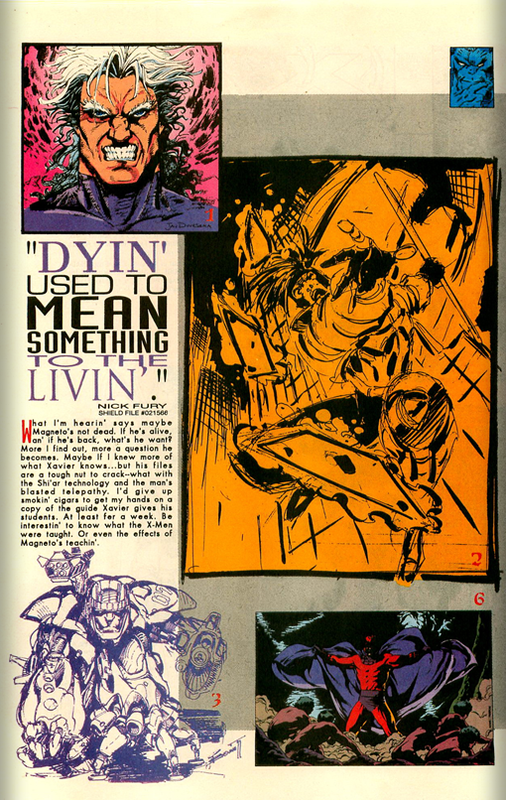 first appearance ( including publication date and art credit), with the cardback text laid over a scene from the character's first appearance. The bottom of the cardback lists a "In the Beginning" factoid. 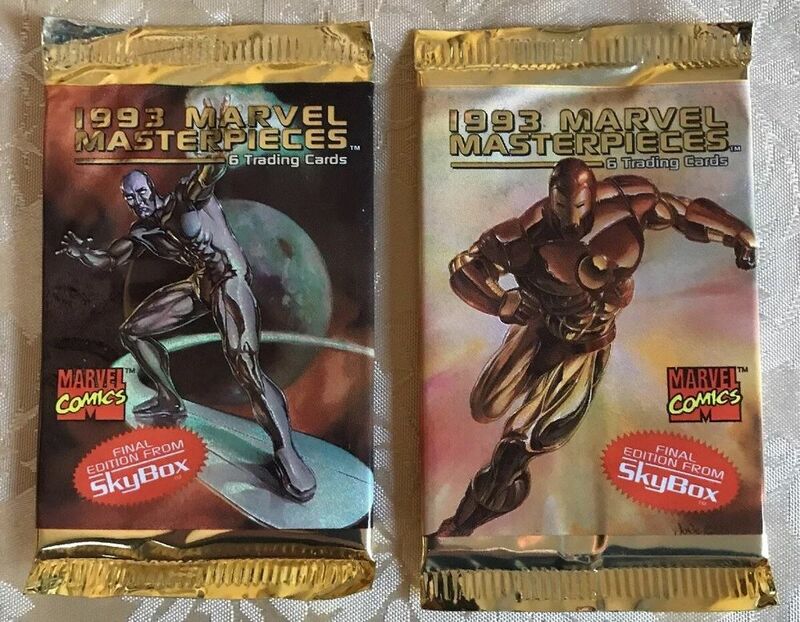 Whereas the first series of Marvel Masterpiece cards were all from artist Joe Jusko, for this series, Marvel enlisted multiple artists (including Jusko again). Spoilers ahead, obviously. 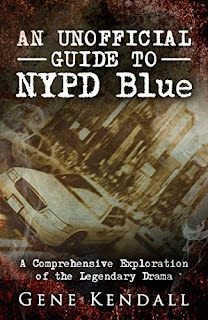 If you haven't yet seen the film, just...don't read this post. Certainly nothing beneath the picture below. "Rumble in the Jungle" / "Arena" / "Masque" / "Bedlam" / "Battleground" / "Afterburn"
On another tropical vacation, Wolverine spots a group of stereotypically-garbed natives attempting to sacrifice a young woman. He rescues her, but in the process gets knocked out by a large ape and his armored companion. 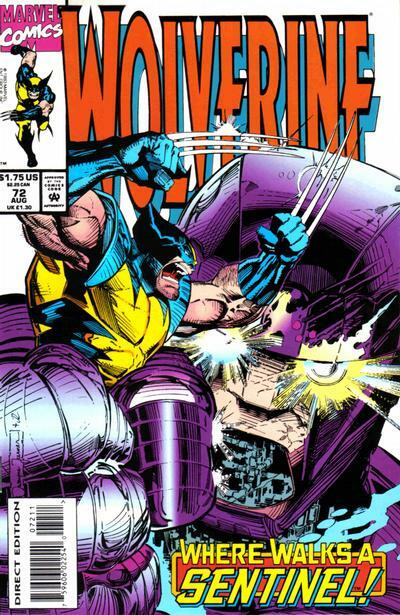 Wolverine awakens in an arena where he fights the ape, until the armored individual joins the fray. Knocking off his helmet, Wolverine is shocked to discover it is Doc Samson. 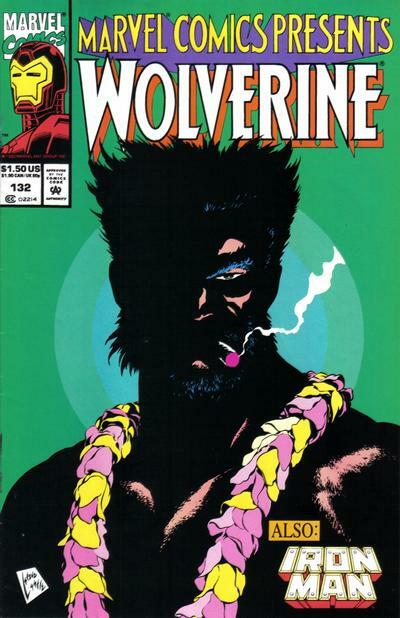 Wolverine then manages to escape from the arena and a clearly-brainwashed Samson, but is recaptured by Samson's native-esque allies, all of whom speak a strange language. 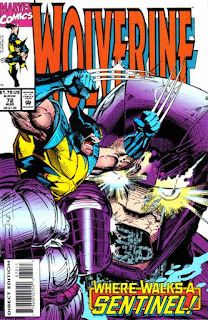 Wolverine is placed in a high-tech machine operated by Samson, but the feedback causes Samson to break free of the natives' control. 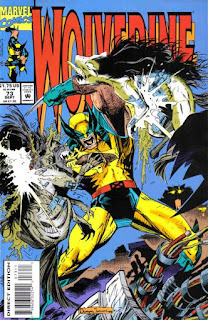 He and Wolverine fight back, during which a portal opens. Wolverine leaps through, fighting back a group of robotic insectoid aliens, of whom the natives are an advance guard for their invasion. On Earth, Samson destroys the portal, just as Wolverine leaps clear. However, the gorilla remains under the aliens' control, and it attacks Wolverine & Samson. Wolverine maneuvers the ape into a nearby temple, which is then blown up by an unscrupulous scientist hoping to clear the land for development, trapping the ape inside. "Home is the Hunter" / "A Kiss Before Dying" / "City of Light" / "Sins of the Fathers"
Sabretooth learns Graydon Creed is his son with Mystique. 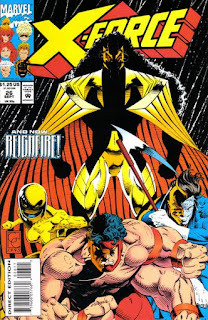 Issue #1: Sabretooth returns home to find a group of Hand ninjas waiting to attack him, but he and his assistant Birdy fight them off, after which the telepathic Birdy gives Sabretooth the "glow", a mental treatment that helps calm him down. That night, Birdy allows a group of mercenaries into the house to capture Sabretooth. 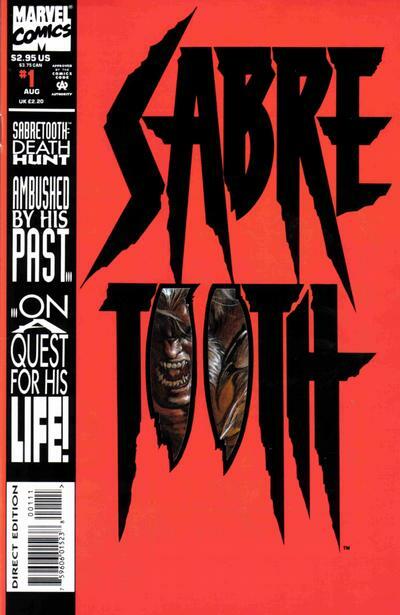 They take him to an armored man named Tribune who has a bomb implanted in Sabretooth's chest. He then gives Sabretooth 48 hours to kill Mystique, warning that if he doesn't, Tribune will detonate the bomb. 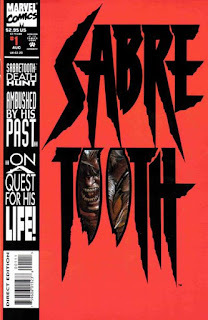 Issue #2: Sabretooth returns home and attacks Birdy, but he doesn't kill her, as he still needs her to provide his glow, but instead takes her with him to Paris, where Mystique is. 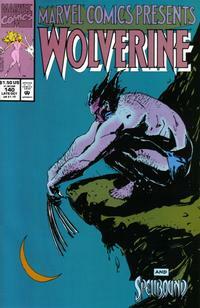 Sabretooth chases her to the top of the Eiffel Tower, where Wolverine is waiting. Force in Focus: A Very Special Episode's Star Wars Extravaganza! I swear I'll be back to reviewing old Star Wars comics very soon, but in the meantime, if you're the podcast-listening sort, this week sees the release of a very special Very Special Episode, the podcast which Dr. Bitz and I cohost (along with a pair of cartoonists & comedians from Portland), dedicated to Star Wars. The idea behind it is a sort of "defense" of Star Wars. 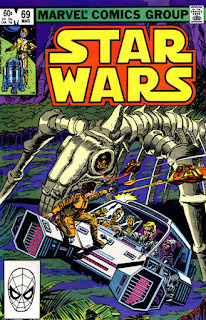 Anyone who's been reading these posts knows I'm a big Star Wars fan, and I generally like more than I dislike. 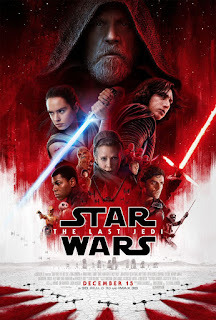 My cohosts, whose Star Wars fandom ranges from the jaded to the casual to not-too-far-from-mine, decided to put forth a bunch of stuff they don't like about the various films, and then have me defend those decisions and explain why their nitpicks and dislikes aren't so bad (or, in some cases, confirm they are). 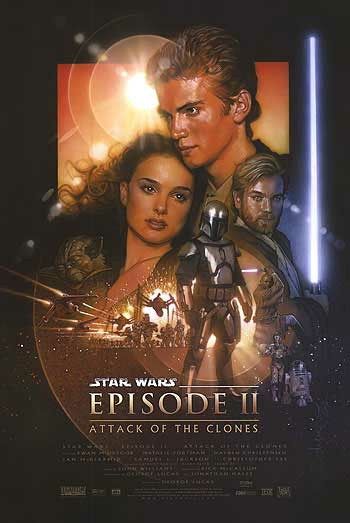 Ultimately though, it's just a big three hour episode celebrating Star Wars. I was fully prepared to bring my best pedantic nerd explanations for things, but in the end, I barely needed them, and nearly everyone spent about as much time talking about the stuff they love from the various films as the stuff that bugs them (needless to say, my faith in the franchise remains unshaken). Amongst the topics of discussion were the unnecessarily-charred corpses of Luke's aunt & uncle, Han Solo's spiritual beliefs, and the stupid noise that lizard-thing Obi-Wan rides in Revenge of the Sith makes. You can listen to and download the episode here, and it's also available via iTunes, Google Play, Stitcher and PodBean. PS this episode is a bit more SFW than some of our fare, but I still wouldn't recommend blasting it loudly from your desk. And in general, we work a little blue, so probably hold off on listening around the kids as well. 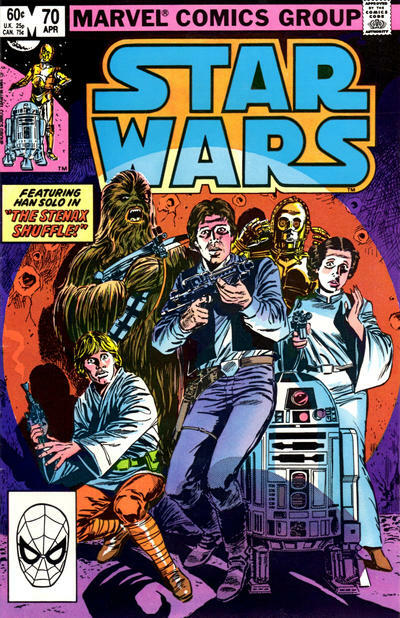 PPS if you haven't already, you can also listen to our episode discussing the infamous Star Wars Holiday special here. 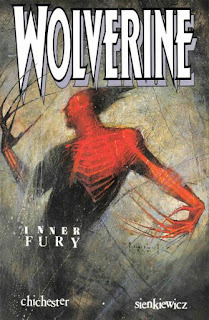 In the wake of losing his adamantium, Wolverine discovers he has bone claws. 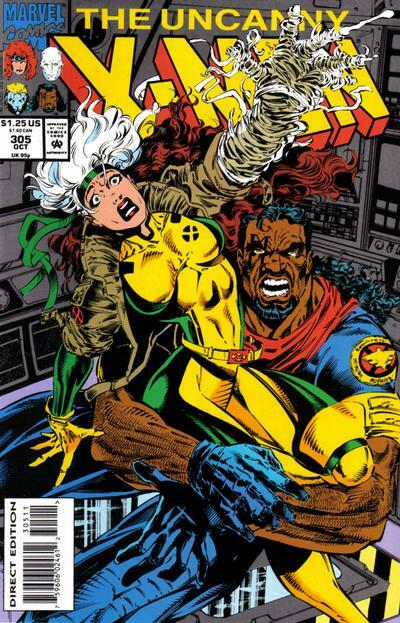 As Professor X & Jean Grey work to keep Wolverine alive, the rest of Xavier's strike team and Bishop fight to bring the Blackbird safely back to Earth. 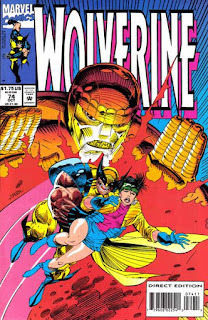 Despite their efforts, Wolverine is fading fast, but when damage to the plane causes Jean to get sucked out the hatch, Wolverine regains consciousness long enough to pull her back inside. Two weeks later, Wolverine orders the X-Men out of the Danger Room, determined to test his mettle in the wake of Magneto's attack on him. 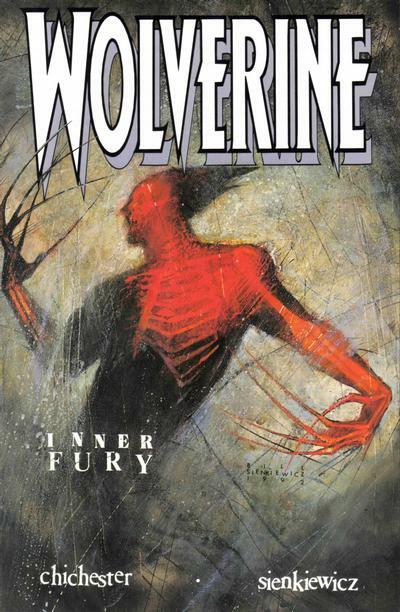 As the X-Men look on in growing concern, Wolverine battles a pair of robots, and when he instinctively pops his claws, he is horrified to discover he has claws made of bone. A few days later, he and Jubilee have a heart-to-heart, as each attempts to deal with the recent changes they've experienced. 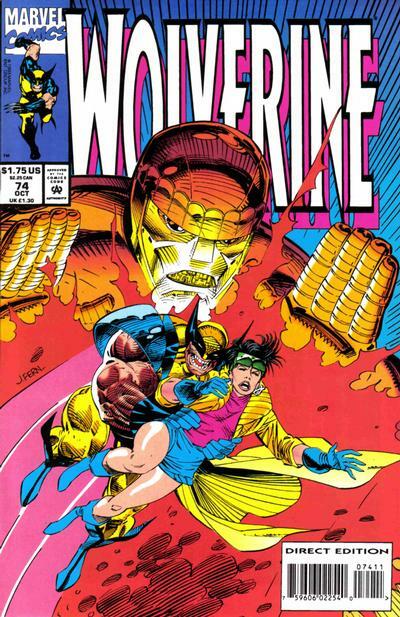 That night, Wolverine leaves Jubilee and the rest of the X-Men letters, explaining his decision to leave the mansion, then rides off into the night as a saddened Jubilee watches from her window. 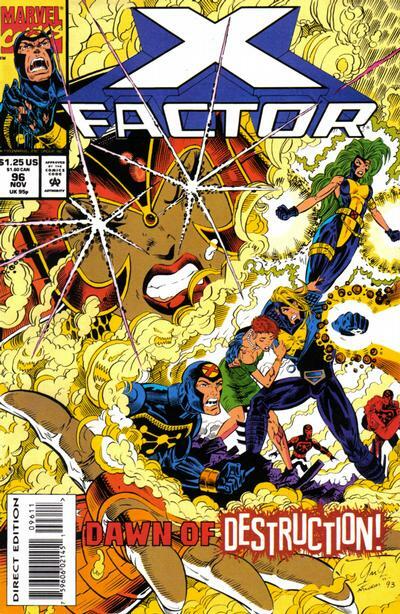 X-Factor responds to a terrorist attack at the Kennedy Center, working through the night to rescue as many people as possible. 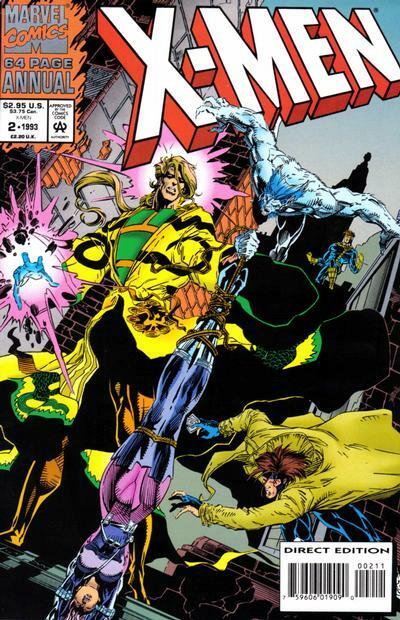 As they finish, Forge appears, and orders Havok into a meeting. Meanwhile, Random meets with his mysterious employer, but afterwards, is marked for termination. At the Pentagon, Havok lays into Forge, but Forge tells Havok there are lots of questions hanging over their heads, and he needs Havok's help to unravel them. 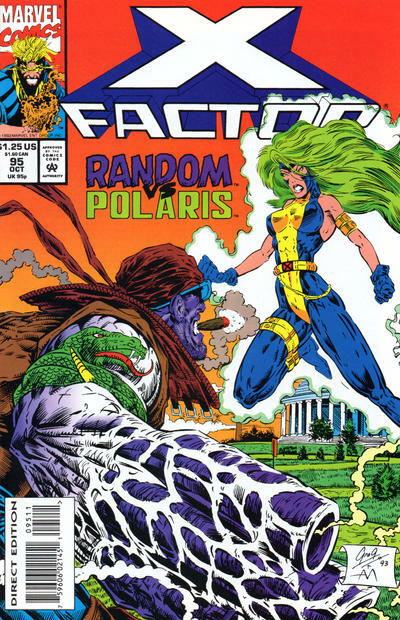 At X-Factor headquarters, Rahne & Lorna share a midnight snack, and Rahne lashes out at Polaris, saying Havok hasn't done enough to help her, but would have if Polaris needed it. 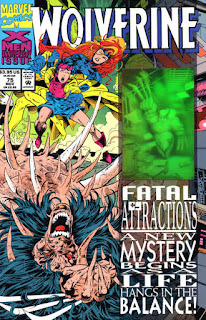 Elsewhere, one of Madrox' dupes takes Guido out on the town, while an increasingly-sick Madrox reads a mysterious book. 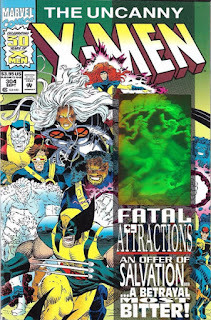 Going for a walk to clear her head, Lorna realizes that Madrox' problems started in Genosha, just as she's attacked by a group of armored soldiers. She holds them off, but before the situation escalates further, the soldiers are teleported away by a mysterious woman who appears before Lorna, telling her to embrace the dawning new age, an age of hope for man, mutant, and the new humanity. 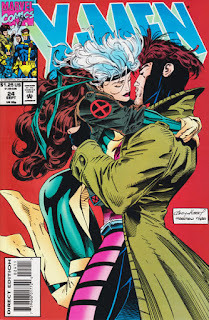 On the anniversary of Candy Southern's death, Jean Grey accompanies Archangel to his home in Colorado, and the pair are stunned to find a very-much-alive Candy waiting for them there. Meanwhile, Xavier spars with Quicksilver in the Danger Room. Back in Colorado, Jean telepathically confirms Candy is who she says she is, while in New York, Storm meets Forge for dinner. 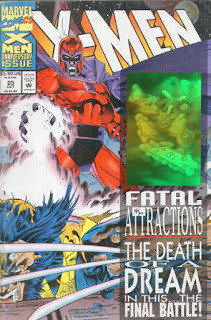 In Colorado, Jean takes Archangel into Candy's mind, and he's horrified to learn she was conscious during his fight with Hodge that led to her death, and learns of the mysterious experiments conducted on her after that death. Just then, the group is attacked by a techno-organic Hodge, who says he is just one of many poised to eradicate mutants. 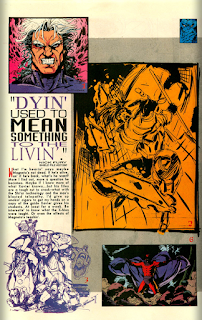 Archangel manages to injure him, but he draws on Candy, who turns out to also be techno-organic, for replacement parts. However, Candy resists, and uses the connection between them to seemingly destroy them both. 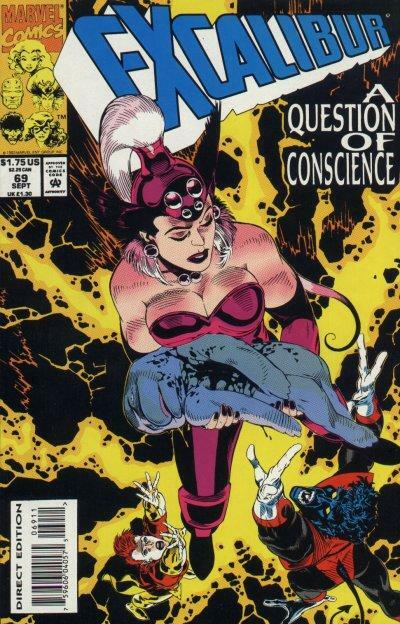 As she dies once again, she tells Archangel she is grateful for the love they shared. Jean tells Archangel it's over but, recalling Hodges words about others, Archangel isn't so sure. The year winds down with something of a whimper, as reviews shift to weekly for December, due to a combination of general holiday/end-of-year busy-ness and a desire to get further back on schedule after a rocky autumn. I also decided I didn't want to split "Bloodties" over the holiday break I was already planning on giving myself when I drew up the second half schedule last summer, so I've shifted some stuff around to move the beginning of that into 2018 (the downside being that the final chapter of "Fatal Attractions" gets pushed back further too, but given how late Excalibur #71 shipped initially, that seems appropriate). 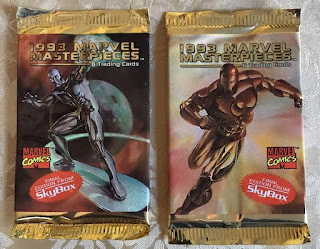 Anyways, here's what I'll be reviewing in December, including the second '93 solo X-character limited series, the final in a long string of regular Marvel Comics Presents Wolverine stories, the second series of Marvel Masterpieces cards, and the conclusion to Tom DeFalco's unofficial "Thor vs. Juggernaut" trilogy. 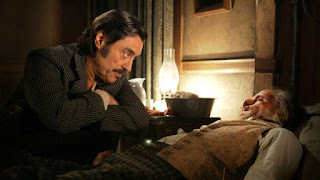 People familiar with the actual history of Deadwood have criticized these final episodes for the purely malevolent portrayal of George Hearst, while the show continues to evolve Al Swearengen into a sympathetic man with his own moral code. Apparently, the reverse was true, with Al as an even nastier figure than we’ve seen on the series (this is a man who recruited prostitutes from orphanages), and George Hearst as a positive influence on the development of the Deadwood community. The debut of Adam-X the X-Treme! 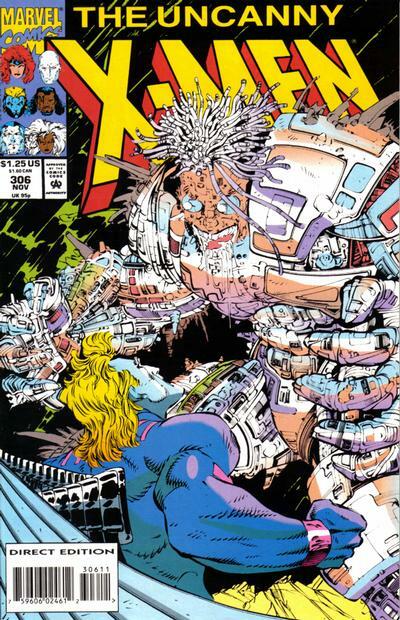 In Phoenix, a mutant named Michelle is hunted by Adam-X the X-Treme, but she is rescued by X-Force, who manage to fight off Adam. They leave the scene, taking Michelle with them, but Adam follows, not realizing that X-Force is well aware of his pursuit and tracking him as well. 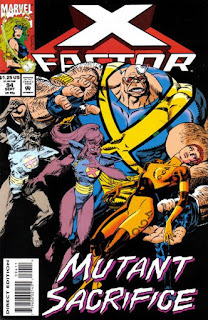 Meanwhile, at the Foundations research facility near Denver, Cannonball & Siryn, posing as interns, break into a secret vault and discover Feral being held captive. Elsewhere, X-Force gets the drop on Adam, and learns he is only helping Foundation head Martin Strong in exchange for info about his past. From Michelle, they learn that Strong is working to find a way to eliminate all mutations, and is being funded by Project: Wideawake, prompting Cable to launch an assault on the facility. Meanwhile, Strong attacks and captures Cannonball & Siryn. 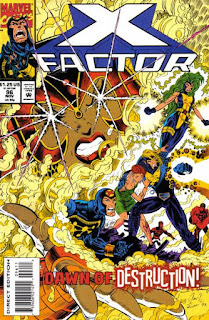 Later, X-Force infiltrates Foundation with the help of Adam, freeing their teammates and attacking Strong, only to be betrayed by Michelle, who genuinely wants Strong to remove her mutation. 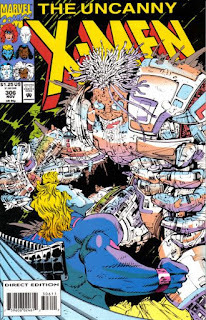 Adam takes her out, after which Cable defeats Strong, revealing his bulky form to be a cybernetic creation housing Strong's true, disfigured & diminutive, form. 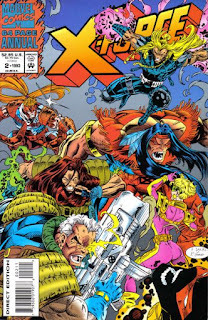 X-Force decides to leave Foundation running, albeit without the help of any unwilling mutants, so as to offer an alternative choice to other mutants with more physical disfigurements like Strong. 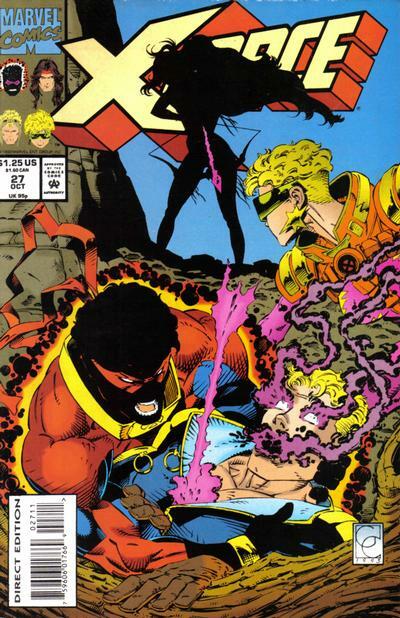 X-Force then teleports away and bids goodbye to Adam, who leaves to search out details of his past. 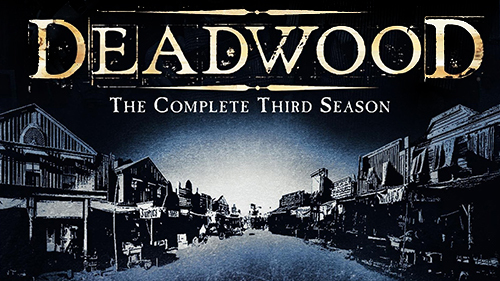 Although some claim that any talk of a four season plan for Deadwood only occurred after the show’s cancellation, it’s become accepted lore that the series was always intended to run this length. 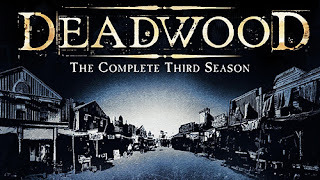 The original Deadwood camp existed for four years before it was consumed by fire, and Deadwood the TV series, we’re now told, was conceived to have each season represent one year of the camp, before ending the show with the eradicating fire. "A Bluer Slice of Heaven" / "Beast Foot Forward"
Jonathan Chambers sets up a haven for victims of the Legacy Virus. 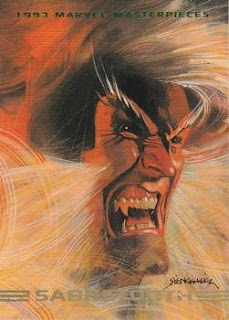 Avalanche & Crimson infiltrate island home of Jonathan Chambers, a mutant author & philanthropist. 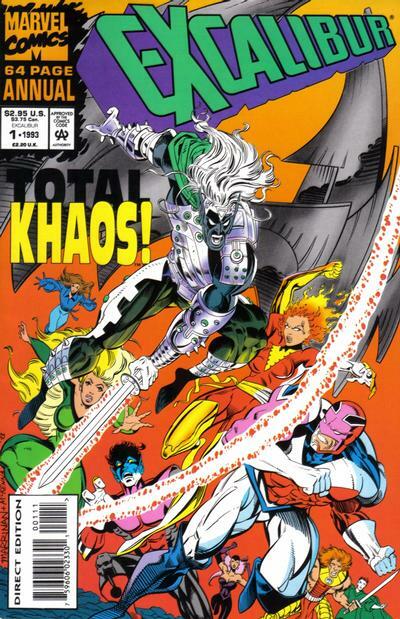 However, they are caught by their old teammates in the Brotherhood of Evil Mutants, who are staying on the island. After a brief skirmish, two sides reunite, with the Brotherhood not knowing that Avalanche & Commando were sent by Henry Peter Gyrich, who is monitoring the island from a nearby boat, suspicious of Chambers recent activities. 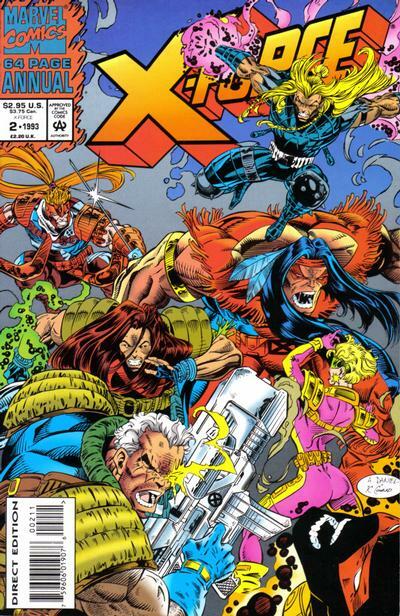 Later, in the wake of the spreading of the Legacy Virus and news that Chambers is hosting the Brotherhood, the X-Men arrive on the island as well. 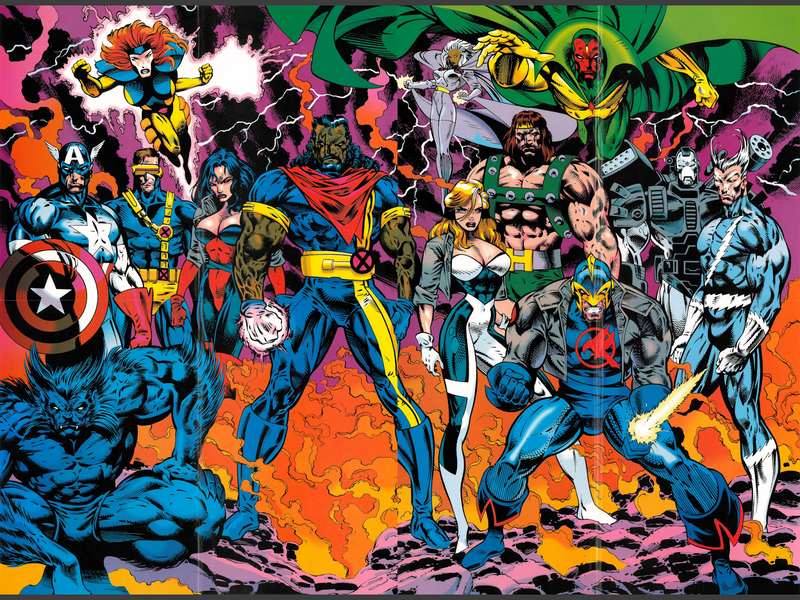 As Beast, Cyclops & Rogue meet with Chambers to feel him out, Gambit, Psylocke & Revanche secretly search the island. 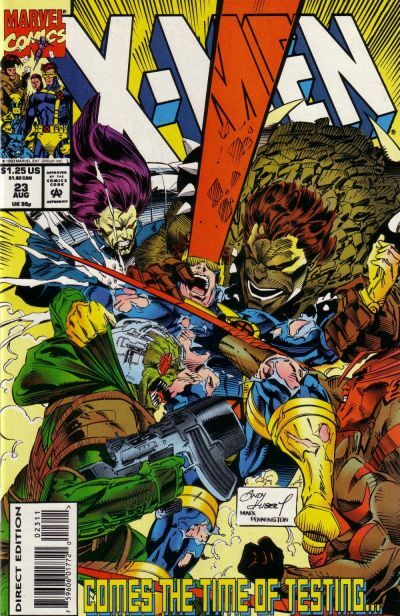 They too encounter the Brotherhood, and a fight breaks out which ends when Chambers intervenes, at which point both Pyro & Revanche reveal they have contracted the Legacy Virus. Pyro declares his intent to stay on the island, which Chambers wants to serve as a haven for those afflicted with the virus, despite Chambers intent to harvest the energy of the dying. The X-Men are reluctant to leave, but Revanche argues they have no right to tell other people how to spend their final days. As they depart, Gyrich arrives, but Cyclops vouches for Chambers, saying they've discovered nothing illegal on the island. 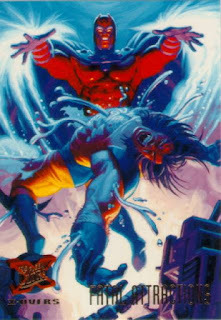 The X-Men then warn Chambers not to take advantage of those seeking his help as they leave. Cerise & Feron leave the series. 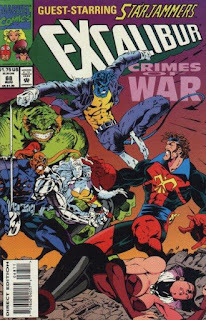 On the prison world of Krag, Cerise is attacked by Fang and is forced to kill her in self-defense, an act which horrifies the arriving Nightcrawler, who appears along with the Starjammers and the rest of Excalibur. On Earth, Feron attempts to snap Meggan out of her catatonia by posing as Captain Britain, but he ends up getting caught in a similar state by her just as Kitty departs for America. Back on Krag, Excalibur & the Starjammers are attacked by prison guards, but the fight is interrupted when Lilandra, speaking through one of the prisoners, appears. 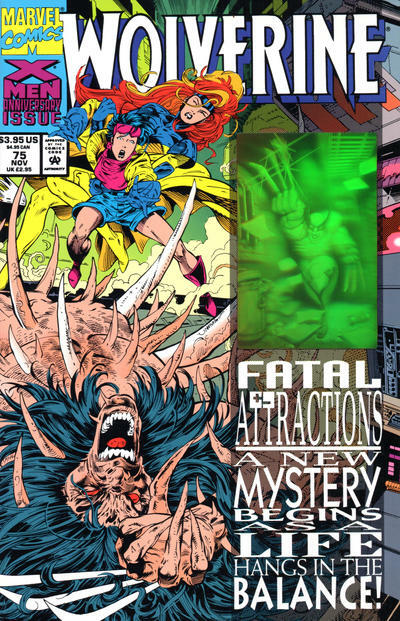 Using the telepathic abilities of the prisoner's race, Lilandra is able to probe Cerise's memories and share them with Excalibur & the Starjammers, showing how Cerise destroyed the vessel on which she was stationed, along with its crew, in order to prevent it from carrying out more acts of genocide on alien worlds. Her name cleared, Lilandra insists that Cerise must serve out her sentence, but at Lilandra's side, working to root out those elements of the empire who would commit similar horrific acts. 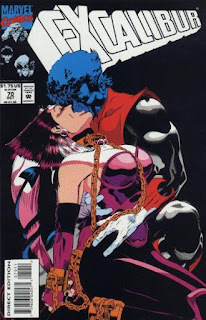 Cerise agrees, and bids a tearful goodbye to Nightcrawler with a kiss. 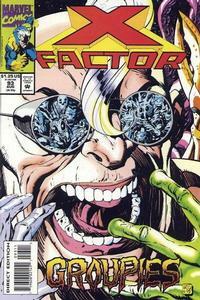 The New Mutant Liberation Front kidnaps Gyrich. 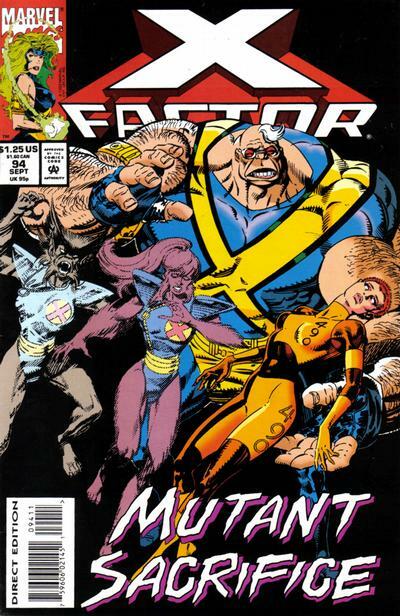 The Mutant Liberation Front attacks Henry Peter Gyrich's house, but when he activates a bio-Sentinel named Hardaway, their new teammates, Locus & Moonstar, are forced to intervene. Taking out Hardaway, they capture Gyrich. 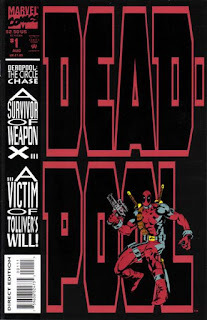 Later, X-Force eavesdrops on a Commission of Superhuman Activities meeting discussing the kidnapping, and decide to rescue Gyrich themselves. Arriving at the MLF's new base, they split into three teams. Cannonball, Rictor, Sunspot & Boomer get into the base first, but are attacked by Moonstar, stunned to realize she may be their old teammate, Dani. Elsewhere, Warpath, Siryn & Shatterstar battle Reaper, Forearm & Wildside while Cable & Feral locate Gyrich. 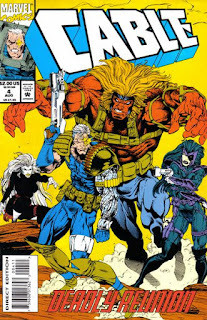 But Reignfire is waiting, and incapacitates them, asking Cable if he'll join him in his war, or betray his kind and die. 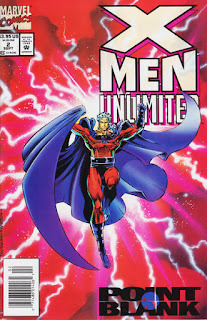 A former East German solider named Adrian Eiskalt recounts to his psychiatrist an encounter with Magneto in which Magneto killed Adrian's brother. In New York, Gabrielle Haller leads a symposium on Magneto, later meeting with Adrian to discuss their respective governments' desire to eliminate the threat he poses. 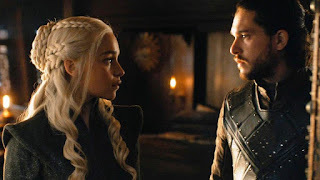 Adrian insists he has no desire to kill Magneto, and Haller agrees to share information, but she can see the desire for vengeance in Adrian's eyes. 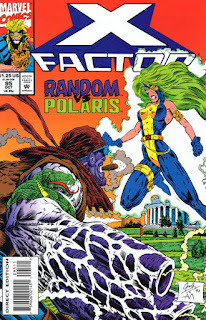 Meanwhile, Exodus offers Phantazia a place on Avalon, but she reluctantly turns him down when he reveals her fellow Brotherhood of Evil Mutant teammates are not invited. As Adrian studies the information on Magneto provided by Haller, Haller compares notes with Moira MacTaggert. This leads to the creation of a suit which will mask Adrian's bio-electric signature, and a taser gun made of plastic. 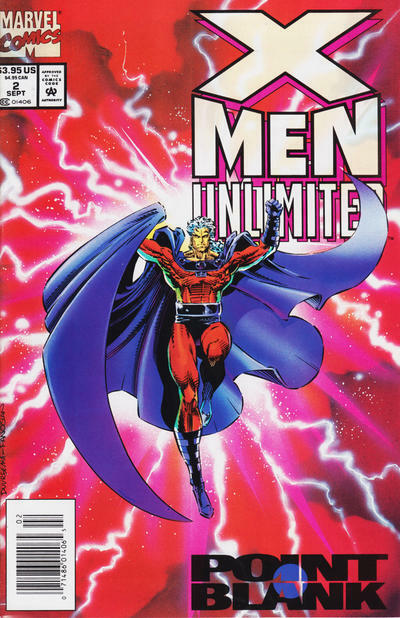 Later, Henry Gyrich briefs the Commission on Super-Human Affairs on Magneto's return, and while the group approves of sending Adrian to engage him, they're uncertain how to draw him out. Adrian has an idea, however, and lays in wait at the site of Magneto's wife Magda's grave, the same spot where Magneto killed his brother years ago. But when Magneto arrives and Adrian has him in his sights, he finds himself unable to act, having gained a better understanding of the man from his research, and realizing that when he killed Adrian's brother, he did so only in self-defense, after Adrian's brother attacked him. As Magneto leaves, Adrian is left alone, realizing all he's ever really had was his hate. 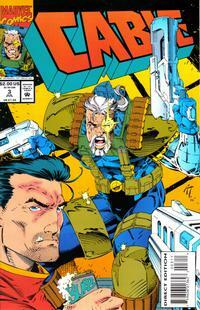 Cable reunites with the Six Pack. 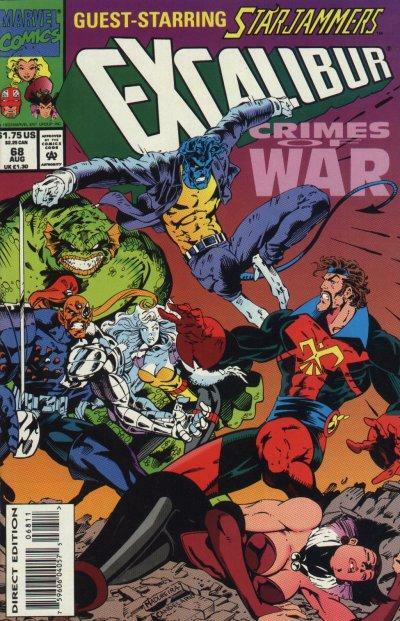 Kane makes a cup of coffee while Bridge & Cable fight, before the pair agree to a truce: Bridge will tell Cable everything he knows about X-Force's whereabouts, in exchange for Cable helping Hammer walk again. 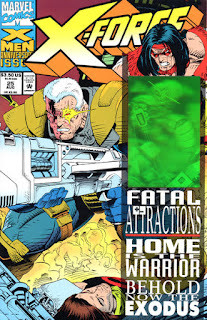 Meanwhile, Vanessa bring Domino, Grizzly & Hammer to X-Force's old base in the Adirondacks, promising she can locate X-Force's current location from inside. In the South Pacific, Sinsear is monitoring transmissions, stopping when he catches a reference to Cable. 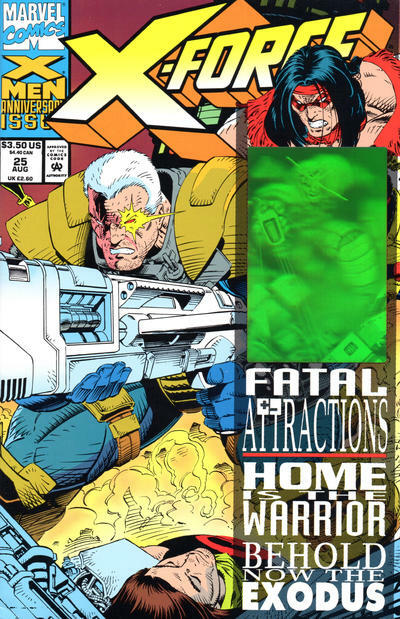 Later, Vanessa brings Domino, Hammer & Grizzly to X-Force's Camp Verde base, just as Cable, Kane & Bridge arrive. Hammer attacks Cable on sight, but Kane gets Hammer to stand down by insisting Cable can help him walk. However, Hammer refuses to become like Cable, more machine than man. 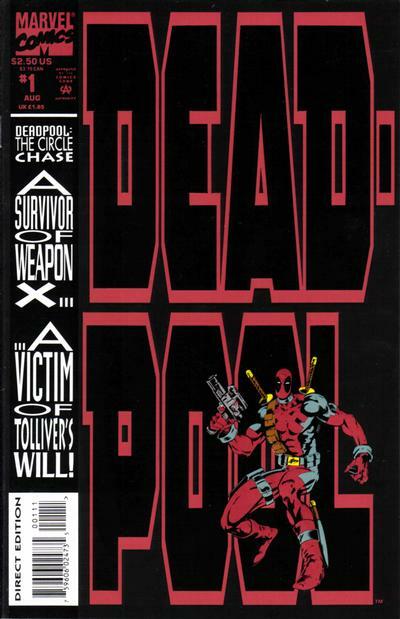 Realizing Vanessa has slipped away, Domino insists on tracking her down, and the rest of the Six Pack, including Kane, agree to go with her, but Cable says he needs to stay behind to wait for X-Force, and Kane tells him to do for them what Cable tried to do for Kane, to do right by them. Deadwood was never a media darling in the same vein as The Sopranos, but its debut season did have respectable ratings, and with HBO eager to maintain its reputation as the place for literate, adult dramas, the series was able to enjoy a boost in its budget for the second season. 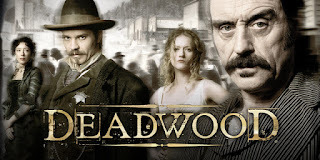 The money is clearly put on the screen, as the sets grow more elaborate, the thoroughfare becomes increasingly crowded with extras, and the number of featured players multiplies.